That's all I think of when I see this lovely salad. Christmas in a bowl and it's SO LOVELY! But what a weird thing to consume during chilly weather. A salad. I don't know about you, but I'm all about the stews and the chilis and basically anything to keep me warm during the chilly months. I stumbled upon this creation for a school assignment. I needed to take ingredients that are healing for women struggling with Premenstrual Syndrome (PMS) and turn them into something yummy. Challenge accepted! I gained inspiration on this dish from a salad my mom *always* makes for potlucks. I'm sure you've had it. It's the one with the cauliflower, broccoli, raisins, cheese and (here's the real kicker) a combo of mayo and sugar for the dressing. ACK! "There had to be a way to clean this potluck classic up", I thought. There's so much beauty behind these ingredients, and for good reason! They pack a PUNCH of power! Cauliflower contains an active compound called Indole-3-Carbinol (whoa, mouthful) which helps the liver metabolize estrogen. This is so fantastic for women struggling with PMS symptoms, allowing those hormones to balance out. Broccoli contains all the good and wonderful things. We know this already which is why we probably didn't like to too much as a kid, but it's such a power veggie! The sulfur compounds in broccoli (or any cruciferous veggie) have the ability to reduce inflammation which means broccoli is one of your greatest anti-inflammatories! Avocado is really the star in this salad because, well, it's avocado (duh). But the key nutrient in avocado is the wonderful fats it is loaded with. Omega-3 fats are the good stuff and this little guy is loaded with those which also helps reduce inflammation in the body (buh bye period cramps!). I could go on and on and on about the beauty behind all these ingredients, but how about you just make the salad and really let me know how it tastes. Because at the end of the day, that's all we really care about (amiright). Take a large bowl and add the shredded kale to it. Pour 1 tbsp of flax oil over the kale along with a sprinkle of sea salt and gently massage for 1-2 mins or until the kale has softened. Add the broccoli & cauliflower to the bowl and stir to combine with the kale. Set aside so you can make the dressing. In a blender or food processor, add the avocado, basil, lemon juice, remaining flax oil and a sprinkle of sea salt. Leave the water out initially. 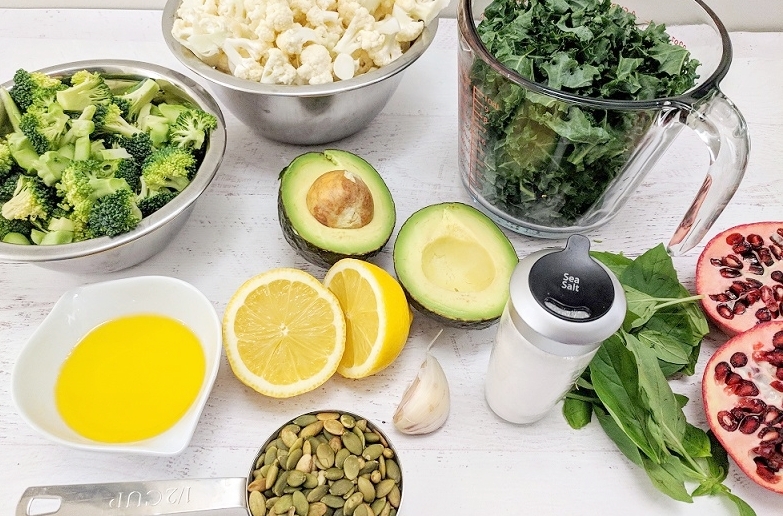 If you have a high speed blender, turn it on high and slowly add the water in amounts of 2 tbsps to allow the dressing to form; you may not choose to use all of the water. If you’re using a food processor, stop every so often to scrape down the sides and add water as needed to create a creamy consistency. Once the dressing has blended, add it to the bowl of kale, broccoli and cauliflower. Stir to combine and coat the vegetables in the creamy goodness! Add in the pomegranate and pumpkin seeds and stir to combine. Divide amongst bowls and top with a sprinkle of sesame seeds as your garnish! ** If you don't have flax seed oil, olive oil or avocado oil will work just fine! Aim to stay away from any "vegetable" oils like canola, rapeseed, grapeseed and/or cotton oil. These aren't health forming and will really negate any of the great foods you're fueling your body with. ** If you feel like getting fancy, shredded your cauliflower into rice size bits for a bit of a different dish!